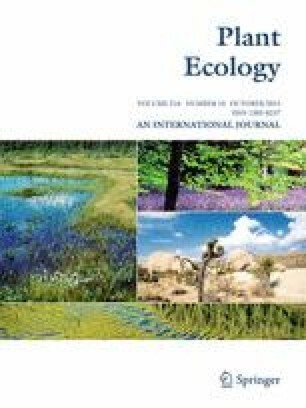 Factors governing the dynamics between woody and herbaceous vegetation in the savanna are of ecological interest since they determine ecosystem productivity and stability. Field measurements were conducted in a humid savanna in the Lambwe valley, western Kenya, to compare CO2 exchange of the herbaceous vegetation and trees and its regulation. Soil characteristics and root distribution patterns under tree canopies and in the open locations dominated by the herbaceous vegetation were profiled in 1-m-deep soil layers. Soil water content (SWC) was measured at 30 cm depth both in the herbaceous vegetation and also under the tree canopies. The mean maximum monthly gross primary production (GPPmax) in the herbaceous vegetation was determined from chamber measurements, while daily GPP (GPPday) in both the grass and tree canopies was simulated using the PIXGRO model. The highest mean GPPmax in the herbaceous vegetation was 26.2 ± 3.7 μmol m-2 s-1 during April. Seasonal fluctuations of GPP in the herbaceous vegetation were explained by soil water availability (R 2 = 0.78) within the upper 30-cm soil profile. Seasonal GPPday fluctuations were larger (between 1 gC m-2 d-1 and 10 gC m-2 d-1) in the herbaceous vegetation compared to the trees, which fluctuated around 4.3 ± 0.3 gC m-2 d-1 throughout most of the measurement period. Daily tree canopy transpiration (Ec), canopy conductance (Gc), and GPPday were decoupled from SWC in the top 30-cm soil profile. On average, ecosystem GPPday (mean of tree and herbaceous vegetation) was 14.3 ± 1.2 gC m-2 d-1 during the wet period and 6.1 ± 0.9 gC m-2 d-1 during drought. Differences between the herbaceous and tree canopy responses were attributed to soil moisture availability. The online version of this article (doi: 10.1007/s11258-015-0523-3) contains supplementary material, which is available to authorized users. We thank the Kenya National Youth Service (NYS) Lambwe unit for allowing us to conduct the experiments on their land, for working tirelessly to secure the equipment, and for supporting with data collection. We thank Mrs. Margarete Wartinger for her support with sample analyses. We are grateful to the British Ecological Society (BES) for providing funds for field work under Grant Number: BES 1430 - 4399.